Need a translation? How about an interpreter? 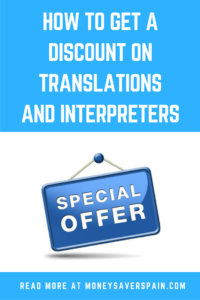 We’ve teamed up with Aire Traducciones in offer you a top-level translation and interpreter service with an exclusive discount for our readers. It’s difficult to live in Spain for any length of time without needing to present an official translation of a document. Or you might just need some help with understanding a contract or other paperwork. Even if your Spanish is OK, how about when you visit the doctor or have to take a case to court? Wouldn’t it be great to have an interpreter to accompany you? Get in touch by email at aire@airetraducciones.com or call 915 635 252 and let them know you read about this promo on Money Save Spain to get your discount.